Certainly you've heard of Grumpy Cat, that feline with a built-in frowny face whose real name is Tardar Sauce and whose owner is Phoenix-based Tabatha Bundesen. If not, you've been living under a rock. Grumpy Cat rose to fame a year ago when someone posted a particularly frowny faced photo of Grumpy Cat on Reddit. Since that time, Grumpy Cat has her own Facebook page with over one million fans and a Twitter account with over 100,000 followers. 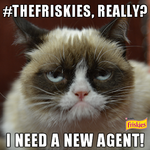 Ms. Grumpy Cat recently signed an endorsement deal with Friskies and will receive a lifetime achievement October 15 when the brand announces the winners of its 2013 best cat video contest.